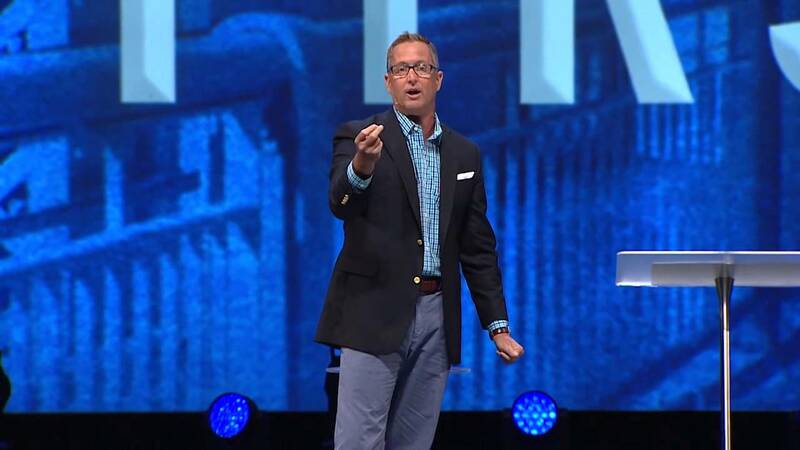 Stovall Weems is the co-pastor of Florida mega-church, Celebration Church, which has eight different campuses. Centered in Florida as the home campus, other locations stretch from Baltimore to Zimbabwe. The other lead co-pastor of Celebration Church is Weems’ wife, Kerri, who helped to plant the church in 1998. They also have a college, which they call Celebration College. The church has an attendance of more that 12 thousand. For his Easter Sunday sermon, Weems told the congregation that instead of expositing or explaining the resurrection from Scripture, he was going to tell his own experience with the resurrected Christ. Disguised in an interview format rather than an expository message, the pastor was asked questions about his encounter with Jesus. He also asked that he be the very first one to leave church that day, purportedly so that he wouldn’t have to answer questions. He then began with a brief reading of Scripture (or the Message or NLT or some various paraphrase). Then, the pastor claimed to have seen the risen Savior on Friday. He continued to say that there was no way he could preach a message about the resurrection on Easter when he actually saw Jesus a few days before. You can listen to the message above. Jesus, of course, is at the right hand of God the Father in Heaven (Colossians 3:1). It’s important that Jesus sit and remain at God’s right hand, because it is there where he makes intercession for us. Peter writes that we cannot now see Christ (1 Peter 1:8-9). Paul the Apostle said that Jesus appeared last to him (1 Corinthians 15:7-8). And not even Paul was allowed to relate the details of their meeting (2 Corinthians 12:4). One should rightly suspect the frivolity of a Florida seeker-friendly pastor being the next, after Paul, to see the resurrected Christ and – unlike Paul – being permitted to blather on about the details. Why would someone make up such a tale? There are several possible reasons. The first is that the individual may be trying to become a part of the New Apostolic Reformation (NAR), a dangerous charismatic movement that asserts that Apostles still exist today (and seeing the resurrected Christ was a prerequisite for Apostleship, and so NAR leaders all have their personal testimony of having seen Jesus face-to-face). Or, this phenomenon often happens when there is strife or inner-turmoil in the church and the spiritual leader is trying to demonstrate their special status as a messenger of God. Or, a book-deal could be in the works, which is often the case. One thing is for sure, however, Pastor Weems did not see Christ face-to-face.